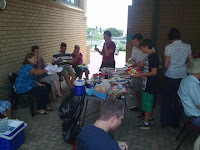 The year got off to a great start for the members of Grace Presbyterian Church by having a celebratory 3rd Birthday braai. The Birthday braai got underway after our Sunday Service, Errol and Dave had already got the fires ready so it was all just a question of getting the meat on. 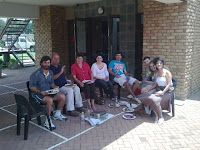 One of the families, along with their extended family, just about took up a whole braai on their own ;-). 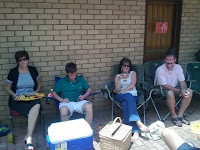 The afternoon was spent enjoying the warm weather and warm fellowship. The ice-creams, for pudding, were luckily cold and many folks ended up having at least a few more cones than just two!!! So happy third birthday Grace Presby, may you have many many more!